Donald Trump, in conceding a second-place finish in Iowa, said he can beat Hillary Clinton in November, citing “so many” polls that show “we beat her and we beat her easily.” In fact, only four of 40 polls listed on Real Clear Politics show Trump beating Clinton — none easily. Trump gave a short speech in West Des Moines, Iowa, after learning of his close second-place finish in the state’s Republican caucus. He predicted victory in November, citing his poll numbers against Clinton (at the 2:27 mark). Trump, Feb. 1: I will say this. I don’t know who is going to win between Bernie and Hillary. I don’t know what’s going to happen with Hillary. She’s got other problems, maybe bigger than the problems she’s got in terms of nominations. But we’ve had so many different indications and polls that we beat her and we beat her easily, and we will go on to get the Republican nomination and we will go on to easily beat Hillary or Bernie or whoever the hell they throw up there. Trump has what Politico described as a “polling obsession.” He “rarely lets an opportunity escape without mentioning his titanic standing” in the polls, Politico said. That’s because, for months, he has been at the top of nearly all national polls for the Republican nomination. But he’s wrong about his head-to-head polling with Clinton in the general election, at least according to Real Clear Politics’ list of national polls. 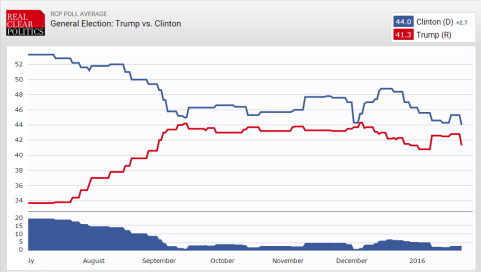 The Real Clear Politics’ polling average shows Clinton with a slight lead, 44-41.3, as the chart below shows. So polling shows a Trump-Clinton race would be close, if the election were held today. But the polling doesn’t indicate that Trump can “beat her easily.” It doesn’t even show that he is the strongest Republican candidate in a race against her. The Real Clear Politics polling average shows Clinton trailing Sens. Ted Cruz, the winner in Iowa, and Marco Rubio, the third-place finisher.